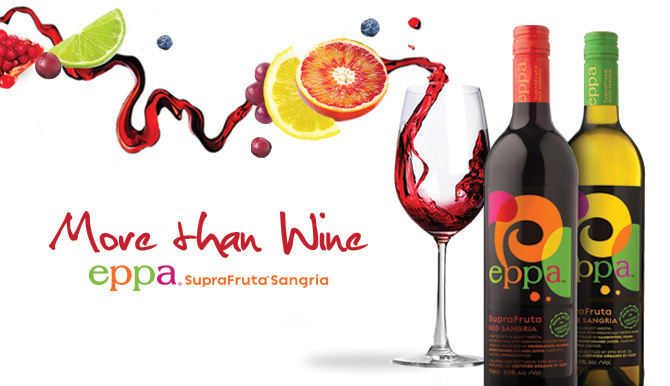 Eppa SupraFruta Sangria is the only rated bottled sangria – earning 90 points from The Tasting Panel Magazine. Eppa SupraFruta Sangria is crafted in Mendocino, California with a blend of real, antioxidant-rich SuperFruit juices blended with premium varietal wines made from certified organically-grown grapes. Eppa Red is made with antioxidant-rich SuperFruit juices including pomegranate, blueberry, blood orange, and acai juices giving it 2 times the antioxidants as a glass of red wine. The taste profile includes sweet citrus scents of orange, lemon and lime with aromas of rich red wine. Dark berry flavors mingle with pomegranate, orange, and soft red wine notes for a smooth style. Eppa White is made with antioxidant-rich SuperFruit juices including mangosteen, peach, mango and blood orange juices giving it nearly 3 times the antioxidants as a glass of white wine. Eppa White has peach and mango aromas bursting from the glass. On first sip, clean, fresh flavors of lemon, lime, and orange delight followed by rich tropical flavors of mango, pineapple and peach. Eppa’s great taste from its premium ingredients including organic SuperFruit juices and premium varietal wines made from organically-grown grapes, allowing it to be certified by California Certified Organic Farmers (CCOF), the oldest organic wine certifier in the country and USDA accredited. Eppa combines great tasting sangria made from premium ingredients with total convenience. Just chill, twist, and enjoy!